The Medina Dam, the fourth largest in the nation when completed in 1913, is listed on the National Register of Historic Places. The irrigation project, creating Medina Lake, was built by 1500 skilled workers who worked in shifts operating 24 hours a day to complete the dam in two years. 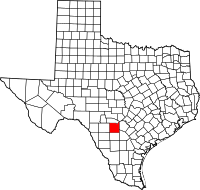 Medina County is part of the San Antonio, TX Metropolitan Statistical Area. The Texas Legislature formed Medina county on February 12, 1848 and enlarged it on February 1, 1850 using land taken from Bexar County. Castroville was the county seat, and the county erected the first permanent courthouse there in 1854. The county seat moved to Hondo in 1892, and a new courthouse was completed there in 1893. According to the U.S. Census Bureau, the county has a total area of 1,335 square miles (3,460 km2), of which 1,325 square miles (3,430 km2) is land and 9.2 square miles (24 km2) (0.7%) is water. As of the census of 2000, there were 39,304 people, 12,880 households, and 10,136 families residing in the county. The population density was 30 people per square mile (11/km²). There were 14,826 housing units at an average density of 11 per square mile (4/km²). The racial makeup of the county was 79.38% White, 2.20% Black or African American, 0.68% Native American, 0.33% Asian, 0.05% Pacific Islander, 14.48% from other races, and 2.88% from two or more races. 45.47% of the population were Hispanic or Latino of any race. There were 12,880 households out of which 39.10% had children under the age of 18 living with them, 63.20% were married couples living together, 11.10% had a female householder with no husband present, and 21.30% were non-families. 18.20% of all households were made up of individuals and 8.20% had someone living alone who was 65 years of age or older. The average household size was 2.91 and the average family size was 3.30. In the county, the population was spread out with 29.00% under the age of 18, 8.40% from 18 to 24, 28.70% from 25 to 44, 21.50% from 45 to 64, and 12.40% who were 65 years of age or older. The median age was 34 years. For every 100 females, there were 105.60 males. For every 100 females age 18 and over, there were 104.90 males. The median income for a household in the county was $36,063, and the median income for a family was $40,288. Males had a median income of $27,045 versus $21,734 for females. The per capita income for the county was $15,210. About 12.00% of families and 15.40% of the population were below the poverty line, including 19.80% of those under age 18 and 15.60% of those age 65 or over. Hondo Creek is located south of Hondo. The Medina County Museum is located off U.S. Route 90 in Hondo. ^ a b "State & County QuickFacts". United States Census Bureau. Archived from the original on July 14, 2011. Retrieved December 22, 2013. ^ Ochoa, Ruben E. "Medina County". Handbook of Texas Online. Texas State Historical Association. Retrieved 18 March 2018. ^ Leip, David. "Dave Leip's Atlas of U.S. Presidential Elections". uselectionatlas.org. Retrieved 2018-07-27. Holt, Jr., C.L.R. (1959). Geology and ground-water resources of Medina County, Texas [U.S. Geological Survey Water-Supply Paper 1422]. Washington, D.C.: U.S. Government Printing Office. Castro Colonies Heritage Association, The History of Medina County, Texas, Dallas, TX: National Share Graphics, 1983). Houston B. Eggen, History of Public Education in Medina County, Texas, 1848–1928 (M.A. thesis, University of Texas, 1950). Cyril Matthew Kuehne, S.M., Ripples from Medina Lake, San Antonio, TX: Naylor, 1966. Bobby D. Weaver, Castro's Colony: Empresario Development in Texas, 1842–1865, College Station, TX: Texas A&M University Press, 1985.